This first issue of the Rogues Reloaded storyline is surprisingly slow-paced for a Flash comic. Joshua Williamson spends a little too long trying to establish the status quo of Central City. 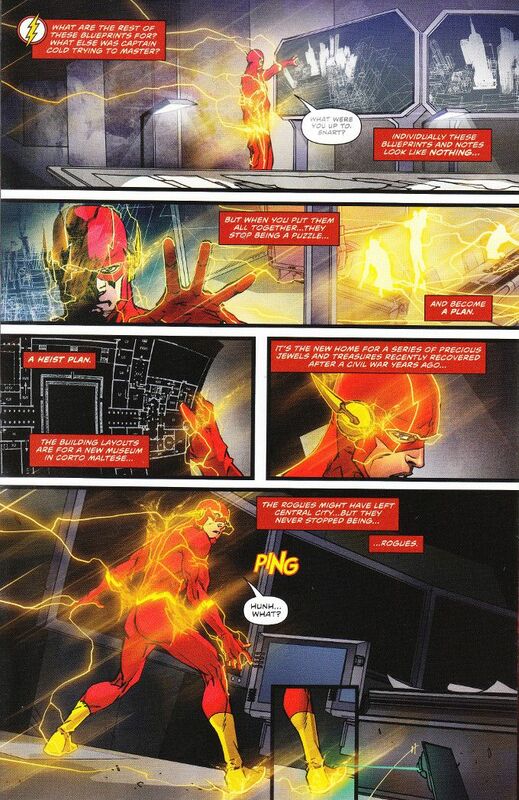 While this may be a necessary evil given how much back-story there is regarding The Rogues, Iron Heights prison, the new Kid Flash and Barry's newfound romance with Iris West, this is still a case of telling rather than showing the story and we wind up hearing precious little about The Rogues in all of it. Hopefully the pace will quicken in upcoming issues. Carmine Di Giandomenico is similarly off his game this time around. There is something inexplicably sloppy about the artwork in this issue, with several pages - particularly in the opening fight between The Flash and Papercut's gang - where the figures are disjointed and the inks muddy the artwork rather than enhancing it. The artwork doesn't look bad, as such, but it's a step-down from the usual level of quality for all involved.